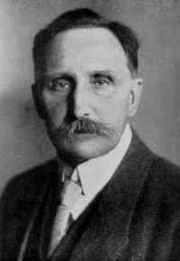 Karl Ernst Haushofer (August 27, 1869 – March 13, 1946) was a German geopolitician, who developed the German concept of Geopolitik. An army officer who had served in Japan as a military attaché, and as a commander on the Western Front in World War I, Haushofer was concerned with the situation following the loss of the war and the effect of the severe sanctions on Germany. Building on the ideas of Friedrich Ratzel and Rudolf Kjellen, that the state can be viewed as a living organism that needs space to live (lebensraum) and sufficient resources to maintain its independence, Haushofer advanced ideas that were adopted by the Nazi regime. Although Haushofer did not align himself with Adolf Hitler's anti-Semitism, partly due to his wife being half-Jewish, he had close connections with the Nazi leadership. Through his student Rudolf Heß, Haushofer's ideas influenced the development of Hitler's expansionist strategies in Germany, resulting in World War II. Haushofer maintained that Hitler misunderstood and distorted his theories; nevertheless, he bears some responsibility for the massive destruction of human life that followed. Karl Ernst Haushofer was born on August 27, 1869 in Munich, Bavaria, Germany. He belonged to a family of artists and scholars. His father, Max Haushofer, was a professor of economics, and his mother was Adele Fraas. On his graduation from the Munich Gymnasium (high school), Haushofer contemplated an academic career. However, service with the Bavarian army proved so interesting that he stayed to work, with great success, as an instructor in military matters. In 1887, he entered the 1st Field Artillery regiment "Prinzregent Luitpold" and completed Bavarian war school (Kriegsschule), artillery academy (Artillerieschule), and Bavarian war academy (Kriegsakademie). In 1896, he married Martha Mayer Doss. Haushofer continued his career as a professional soldier, serving in the army of Imperial Germany, and rising through the Staff Corp by 1899. In 1903, he began teaching at the Bavarian Kriegsakademie. In 1908, the army sent him to Tokyo as a military attaché, to study the Japanese military system and to advise them as an artillery instructor. The assignment changed the course of his life. During the next four years he traveled extensively to the Far East, learning Korean, Japanese, and Mandarin, aside from already speaking Russian, French, and English. From 1911 to 1913, Haushofer worked on his doctorate in philosophy from Munich University. His thesis was on Japan, entitled: Dai Nihon, Betrachtungen über Groß-Japans Wehrkraft, Weltstellung und Zukunft. At the age of 45, he received his doctorate in political geography. By World War I, he had attained the rank of General, and commanded a brigade on the western front. He became disillusioned after Germany's loss and severe sanctioning, retiring with the rank of Major General in 1919. Haushofer, like some other prominent Germans, attributed Germany's loss to the betrayal of communists and Jews. At this time, he forged a friendship with the young Rudolf Hess. Haushofer began working as a professor of geography at Munich University in 1921, gaining international recognition among academia and intellectuals. Adolf Hitler and Rudolf Hess relied on Haushofer's international contacts to legitimize Nazi ideology and philosophy. In 1922, Haushofer founded the Institute of Geopolitics in Munich, from which he proceeded to publicize geopolitical ideas. By 1924, as the leader of the German geopolitik (geopolitics) school of thought, Haushofer established a monthly journal, Zeitschrift für Geopolitik, devoted to geopolitik. His ideas would reach a wider audience with the publication of Volk ohne Raum by Hans Grimm in 1926, popularizing his concept of lebensraum. Haushofer exercised influence both through his academic teachings, in which he urged his students to think in terms of continents and emphasizing motion in international politics, and through his political activities. While Hitler's speeches would attract the masses, Haushofer's works served to bring the remaining intellectuals into the fold. During his multiple visits to Japan, Haushofer made the acquaintance of Japanese politicians and opened channels of informal diplomacy which would bear fruit later. (Japan had allied itself to the Great Britain during World War I, though it had gained precious little benefit for so doing.) After Hitler came to power in 1933, Haushofer was instrumental in developing a German alliance with Japan. Most of the meetings between high ranking Japanese officials and Nazi leaders took place in Haushofer's home near Munich. He saw Japan as the brother nation to Germany. Haushofer, however, was not without problems with the Nazi regime. His wife, who was half-Jewish, had to be protected by Hess's influence (who managed to have her awarded "honorary German" status). His son was implicated in the July 20 plot to assassinate Hitler and was eventually executed by the Gestapo. Haushofer himself was imprisoned in Dachau concentration camp for eight months, and his son and grandson were imprisoned for two-and-a-half months. After World War II Haushofer was interrogated by Allied forces to determine if he would need to stand trial at Nuremberg for war crimes. Although it was determined that he had not committed war crimes, on March 13, 1946, Haushofer and his wife committed suicide together by drinking poison, in Pähl, West Germany. Besides devotedly studying Schopenhauer’s works, during his stay in the Far East, Karl Haushofer was introduced to Oriental esoteric teachings. He became proficient enough to translate several Hindu and Buddhist texts, and became an authority in Oriental mysticism. Of particular interest to him was a long extinct Aryan tribe, which had settled in the Irano-Indian area. Haushofer also sparked interest among other Nazi leaders, such as Heinrich Himmler, in Japanese ideologies. Early in his career, Haushofer was exposed to the work of Friedrich Ratzel who was a friend of Haushofer's father. In his own work, Haushofer defined geopolitik in 1935 as "the duty to safeguard the right to the soil, to the land in the widest sense, not only the land within the frontiers of the Reich, but the right to the more extensive Volk and cultural lands. Culture itself was seen as the most conducive element to dynamic special expansion. It provided a guide as to the best areas for expansion, and could make expansion safe, whereas projected military or commercial power could not. Haushofer even held that urbanization was a symptom of a nation's decline, evidencing a decreasing soil mastery, birthrate, and effectiveness of centralized rule. Haushofer integrated Ratzel's ideas on the division between sea and land powers into his theories, saying that only a country with both could overcome this conflict. While Ratzel and Kjellén's geopolitik viewed the state as a living organism existing in space and put into the service of a leader, Haushofer's Munich school specifically studied geography as it related to war and designs for empire. Haushofer believed the Germans' lack of geographical knowledge and geopolitical awareness to be a major cause of Germany’s defeat in World War I, as Germany had found itself with a poor alignment of allies and enemies. To Haushofer, the existence of a state depended on living space—lebensraum—the pursuit of which must serve as the basis for all policies. Germany had a high population density, whereas the old colonial powers had a much lower density, a virtual mandate for German expansion into resource-rich areas. Space was seen as military protection against initial assaults from hostile neighbors with long-range weaponry. A buffer zone of territories or insignificant states on one's borders would serve to protect Germany. Closely linked to this need, was Haushofer's assertion that the existence of small states was evidence of political regression and disorder in the international system. The small states surrounding Germany ought to be brought into the vital German order. These states were seen as being too small to maintain practical autonomy, even if they maintained large colonial possessions, and would be better served by protection and organization within Germany. In Europe, he saw Belgium, the Netherlands, Portugal, Denmark, Switzerland, Greece, and the "mutilated alliance" of Austro-Hungary as supporting his assertion. Thus, Haushofer justified lebensraum, even at the cost of other nations' existences because conquest was a biological necessity for a state's growth. Pan-regions (Panideen) - idea based on the British Empire, and the American Monroe Doctrine, Pan-American Union and hemispheric defense. Frontiers - his view of barriers between peoples not being political (borders) nor natural placements of races or ethnicities but as being fluid and determined by the will or needs of ethnic/racial groups. Rudolf Hess, Hitler's secretary who would assist in the writing of Mein Kampf, was a close student of Haushofer's. While Hess and Hitler were imprisoned after the Munich Putsch in 1923, Haushofer spent six hours visiting the two, bringing along a copy of Friedrich Ratzel's Political Geography and Carl von Clausewitz's Vom Kriege. After WWII, Haushofer denied that he had taught Hitler, and claimed that the National Socialist Party perverted Hess's study of geopolitik. He saw Hitler as a half-educated man who never correctly understood the principles of geopolitik passed onto him by Hess, and Foreign Minister Joachim Ribbentrop as the principal distorter of geopolitik. While Haushofer accompanied Hess on numerous propaganda missions, and participated in consultations between Nazis and Japanese leaders, he claimed that Hitler and the Nazis only seized upon half-developed ideas and catchwords. Furthermore, the Nazi party and government lacked any official organ that was receptive to geopolitik, leading to selective adoption and poor interpretation of Haushofer's theories. Haushofer also denied assisting Hitler in writing Mein Kampf, saying that he only knew of it once it was in print, and that he never read it. Haushofer was never a member of the Nazi Party, and did voice disagreements with the party, leading to his brief imprisonment. Haushofer came under suspicion because of his contacts with left wing socialist figures within the Nazi movement (led by Gregor Strasser) and his advocacy of essentially a German–Russian alliance. This Nazi left wing had some connections to the German Communist Party and some of its leaders, especially those who were influenced by the National Bolshevist philosophy of a German-Russian revolutionary alliance, as advocated by Ernst Niekisch, Julius Evola, Ernst Jünger, and other figures of the "conservative revolution." Haushofer did profess loyalty to Hitler and make anti-Semitic remarks on occasion. However, his emphasis was always on space over race, believing in environmental Social Darwinism, rather than racial determinism. He refused to associate himself with anti-Semitism as a policy, especially because his wife was half-Jewish. Karl Haushofer's work developing the German Geopolitik served to turn the behavioral rules of previous geopoliticians into dynamic doctrines for action on lebensraum and world power. These were adoped by Adolf Hitler and the Nazi regime, used to support their aggressive expansionist program, and thus to World War II. Haushofer denied directly influencing this action claiming that Hitler's version of Geopolitik greatly distorted his theories, and it was determined that he was not guilty of war crimes, he and his wife committed suicide, reflecting his acknowledgment of some degree of responsibility for the horrors that had resulted. Haushofer and the Munich school of geopolitik eventually expanded their conception of lebensraum and autarky, first in a form of a New European Order, then as a New Afro-European Order, and eventually as a Eurasian Order. This concept became known as a pan-region, taken from the American Monroe Doctrine, and the idea of national and continental self-sufficiency. This was a forward-looking refashioning of the drive for colonies, something that geopoliticians did not see as an economic necessity, but more as a matter of prestige, and putting pressure on older colonial powers. The fundamental motivating force would not be economic, but cultural and spiritual. Haushofer was, what is called today, a proponent of "Eurasianism," advocating a policy of German-Russian hegemony and alliance to offset an Anglo-American power structure's potentially dominating influence in Europe. Haushofer, Karl E. 1925. Geopolitik des Pazifischen Ozeans. Berlin: Kurt Vowinckel. Haushofer, Karl E. 1928. Bausteine zur Geopolitik. Berlin: Kurt Vowinckel. Haushofer, Karl E. 1934. Weltpolitik von heute. Zeitgeschichte-Verlag Wilhelm Undermann. Haushofer, Karl E. 1941. Japan baut sein Reich. Zeitgeschichte-Verlag Wilhelm Undermann. Heske, Henning. 1987. "Karl Haushofer: His role in German politics and in Nazi politics" in Political Geography, 6. 135-144. Mattern, Johannes. 1942. Geopolitik: Doctrine of National Self-Sufficiency and Empire. Baltimore: The Johns Hopkins Press. Walsh, S.J., and A. Edmund. 1949. Total Power: A Footnote to History. New York: Doubleday & Company, Inc. Biography: Karl Haushofer – Short biography on Deutsche Historische Museum of Berlin website. This page was last modified on 12 April 2018, at 14:00.